The hotel is located only a 10 minute helicopter ride or 35 minutes by car from Nice airport. This breathtaking peninsula is like a natural Eden reinvented, a garden floating on water. 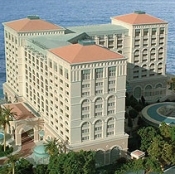 Charm and relaxed elegance characterize the hotel, situated at the waterfront of Monte Carlo Bay. Over 75 percent of the luxuriously appointed guest rooms and suites feature a private balcony and sea view. These spacious rooms offer 484 square feet of privacy and comfort, space and light decorated with pale marble and exotic woods. With an azure blue lagoon and neoclassical architecture featuring arcades and collonades, the resort is an oasis of waterfalls, Mediterranean gardens, terraces and a solarium. The first Monte Carlo resort built with every business need in mind, Monte Carlo Bay Hotel and Resort offers facilities and services for every type of guest. From meeting and conference facilities and fully-equipped business center to indoor and outdoor swimming pools, sandy-bottomed lagoon, concert hall, casino and a myriad of dining opportunities and entertainment, Monte Carlo Bay Hotel and Resort is the ultimate resort.